1 When Should You Use Saltwater Lures? 2 How Are Saltwater Lures Made? 3 What’re the Best Saltwater Lures for Each Condition? The lures we’re going to cover today are so effective they should be BANNED! Well, they won’t be, but that means you should grab a pair so you get some of the action too. If you also freshwater fish, but sure to check out our 15 Must-Have Freshwater Lures. When Should You Use Saltwater Lures? When it comes to saltwater fishing, you must have the best and the toughest equipment. Your saltwater fishing gear needs to stand up to the toughest conditions. This is especially true with saltwater fishing lures. These lures have to stay strong through aggressive strikes and hold up to saltwater itself. You should use the best saltwater lures when you’re fishing for large species found in the ocean and ocean outcrops. Saltwater lures can handle large fish species and saltwater conditions. How Are Saltwater Lures Made? Making lures uses lightweight wood or foam with thin sheet metal. If you add plastic on the front it creates makes the lure dive under the water’s surface and swimming with a “wobbling” movement on retrieval. Some are handmade while large production runs use machines. Most of the best surf fishing lures and topwater poppers are handmade. What’re the Best Saltwater Lures for Each Condition? Topwater lures work best in warmer conditions, while fish species are feeding close to the top. These lures are for the larger fish and/or cooler water fish that tend to feed lower in deeper water. Trolling lure get dragged “trolled” behind a boat. These lures work well for faster-moving fish. Surf Fishing lures and surf fishing rigs designed for use when fishing from the bank. These lures work well for fish that feed closer to the shore. Several different types of saltwater fishing lures can be used when pier fishing. Type and style depend on the fish species you are fishing for. This saltwater fishing lure is designed by ECOODA to Lure super fish in blue water. It uses both high strength ABS material and conjoined welding wire make the lure handler more than 100 kg pull strength. No need to pull much when trolling as it’s easy to control and very flexible when swings left and right. The swimming action is very stable and natural. 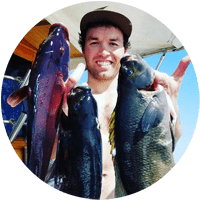 Perfect to target a variety of pelagic species from tuna and mackerel, mahi-mahi, wahoo, barramundi, kingfish, marlin, and more. Very realistic actions and look. High quality, holds up well. Easy to see in clear to moderately clear water. Impressive lifelike patterns/colors powered by wLure RealSkin technology make this lure irresistible. Eagle Claw Shape treble hook, makes the hooks on this lure 125% sharper than regular hooks. Run true out of a box and never rust in saltwater. Weight: 1/2 oz, 6 Lures with Free Tackle Box! Performs like a live fish, looks natural. Works with freshwater fish also. This Mustad lure is strong, forged with a high carbon steel hook w/ a double heat shrunk military grade kevlar assist cord. Mustad stainless steel 1000 LB test heavy pressed solid rings & Mustad “Mighty Mini” Split Rings. Comes with 242 lb test, means this lure can stand up to anything. Durable 5x multi-coat color utilizing the top essential attractant colors in fishing science. Superior construction assures a perfect swimming bait right out of the box. Toss it out. Pump. Reel. Pump. Reel. You are “Walking-the-Dog.” The weighted tail keeps the bait in natural position even at rest. Large internal rattles create a rhythmic side-to-side motion-and-sound combination. This imitates wounded or fleeing baitfish. 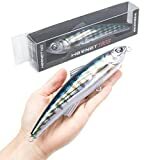 This lure features 3D holographic eyes and you can choose from appetizing painted or chrome color patterns. All equipped with VMC black nickel hooks. Catches many different species of fish. Tracks straight with realistic action. Easy to fish lures that swim great, with a nice kick and terrific action. Also deadly when vertically jigged. Cast or trolled, this spoon sports a unique wiggling-and-wobbling action that is irresistible to pike, walleye, bass, tuna, and all hungry other game fish species. 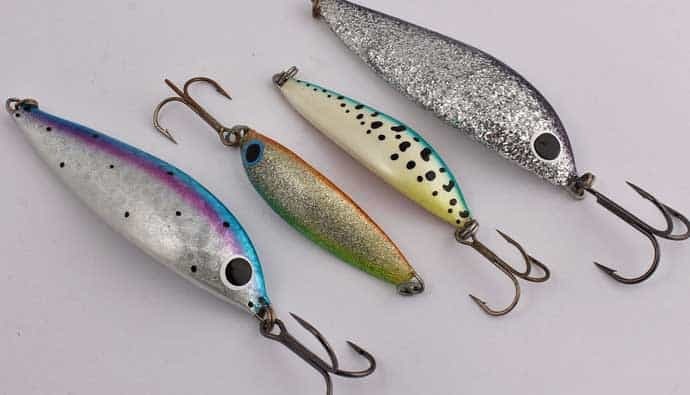 It vibrates on the pull and flutters on the fall, a never-ending mix of flash and thump that imitates a struggling baitfish, and forces predators to react. Whether you’re drifting reefs, casting flats, or pitching the surf, you’ll enjoy fishing the FAIGAFAIVA XD5ES jig spoons. The XD5ES featured extra-large 3D holographic eyes and a 3D textured scale finish with durable reflective foil bring big tuna from all directions. Features high-quality treble hooks. A true must-have! Has an authentic hurt fish action. Nice for fish such as bass, yellow perch, walleye, pike, muskie, roach, trout, etc. Suitable for seawater and freshwater. These lures create life-like swimming actions in water! Bright colors to attract big fish! 3D eyes make it a powerful catching tool. Durable material contributing to long service life. Perfect for ocean boat fishing, ocean rock fishing, ocean beach fishing, lake, river, reservoir, pond, and stream! Both for freshwater and saltwater Great for Bass, Perch, Panfish, Perch, Trout, even pike, and salmon. This kit is the best gift for your friends and families. Lures that cater to a large variety of fish. Great value for the number of lures. 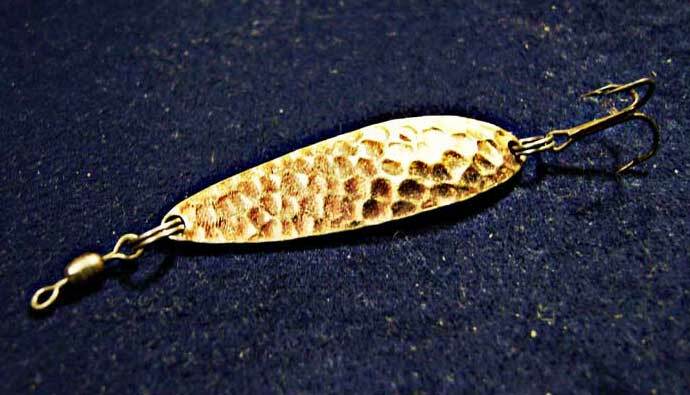 Saltwater fishing lures like their freshwater cousins have been around for many years. 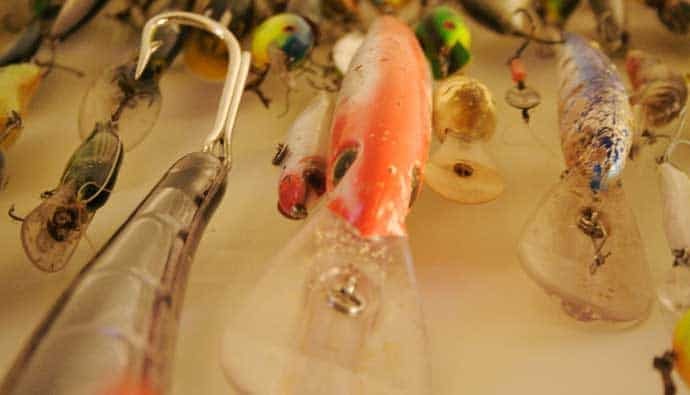 These lures have seen many improvements over the years that help anglers catch more fish. 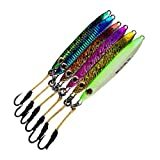 We feel the best saltwater fishing lures, out of the ones we have reviewed is the Aorace 30pcs Fishing Lures Kit Mixed. A great value for the number of lures and the performance of each to help you catch more fish. Q: What is the best fishing lure? 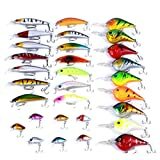 Aorace 30pcs Fishing Lures Kit Mixed including Minnow Popper Crankbaits With Hooks For Saltwater Freshwater Trout Bass Salmon Fishing. Q: What kind of bait to use for saltwater fishing? A: This depends on the species of fish you are targeting. While many saltwater fishing lures work great, live bait is always a good choice. Q: What are the best lures for redfish? Q: What lures to use for red drums? A: Trolling lures work best for red drum fishing. Q: What are the best lures for saltwater fishing? Q: What lures catch what fish? A: Topwater lures ( plugs ) work for warm water active fish that feed close to the surface, where dive baits work for the larger bottom-dwelling fish. Q: How to fish different lures? A: Different style lures have different actions on the angler’s part to make them look as realistic as possible. For example; a trolling lure would be fished being pulled by a boat, where a topwater lure would be “finessed” by jerking movements. Q: How to use a fishing lure? A: A fishing lure is intended to resemble prey or an injured fish. It is important that you “work” your lure in such a way that imitates the prey or fish it is designed to resemble. Q: How do you use a spoon fishing lure? A: The most desired action is not to have the spoon spin around on the retrieve but to have it wobble back and forth without spinning. This slower wobble allows the flash to be spread out effectively. A crippled baitfish wobbles in this same manner, they do not spin over in circles. Q: How to jig fish saltwater? A: Using a tail weighted jig, drop the jig over the reef. When it hits bottom, in a rhythmic motion, jerk the saltwater rod while cranking the saltwater reel to retrieve the braid in a rapid fast motion until it reaches the boat. Drop and repeat in a tight compact circular motion, and remember cadence is key. You will be amazed at the different depths you will catch fish. Sometimes they will hit it on the bottom, midway or even sometimes just meters away from the boat. Remember to establish a rhythm, focus on the rod tip and keep the cadence going. Q: How to catch saltwater fish from the shore? A: Also known as “surf fishing” You can use live bait or lures depending on the fish you are fishing for. Q: How to fish spoons? A: Spoons come in so many shapes and sizes because there are so many ways to fish this lure and so many different kinds of fish that will eat them. Vertical Jigging, this is the number one spoon technique most anglers think of when they find this lure in their tackle boxes. Spoons excel here. 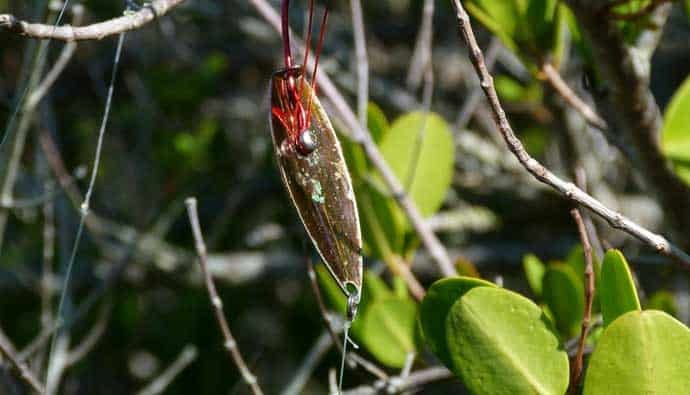 No other lure can give you the flash and flutter of a well-made spoon on the drop, and there isn’t a fish alive that resists a wounded-baitfish wobble. Q: How to use Gotcha lures? A: Gotcha lures are simple to use. Cast and reel in using short, sharp jerks of the rod to produce a deadly swimming action.